Officials working closely with initiative organizers who got the measure passed. 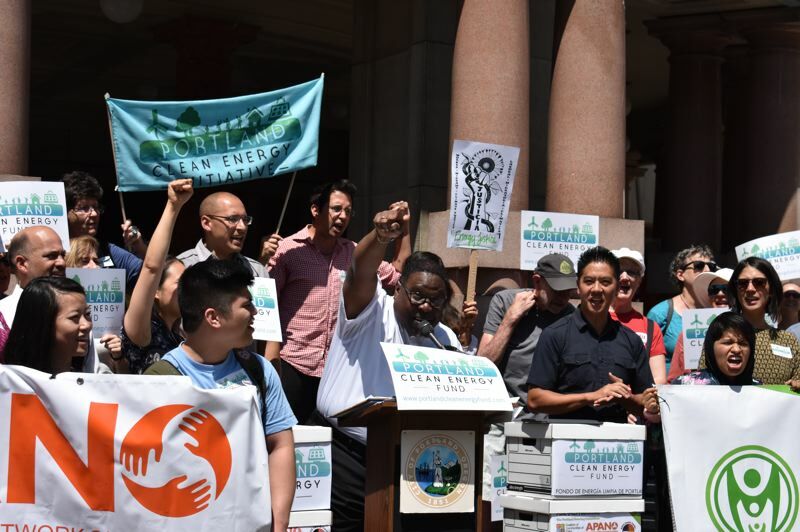 When Portland voters approved the first-of-its-kind Portland Clean Energy Fund in November, it represented a huge victory for the coalition of environmental activists and groups representing people of color that crafted the measure and led the campaign. Now, as the city lays the groundwork to turn voters' wishes into reality, city leaders are working closely with the "green, brown and black" coalition that conceived the measure. Amanda Watson, Mayor Ted Wheeler's adviser for environmental and sustainability policies, says regular meetings are taking place involving the relevant city bureaus, city commissioners and their staff, and the executive committee for the Portland Clean Energy Fund campaign. That includes leaders of 350.PDX, the NAACP, Sierra Club, Verde, Coalition of Communities of Color, Physicians for Social Responsibility and several others. "We're really committed to everything being a collaborative process," Watson said, given the "groundbreaking" nature of the measure. Groups that sponsored the measure appreciate being able to team with the city to help launch the new program. "They have shown a dedication to (respecting) the will of the voters," said Jenny Lee, advocacy director for the Coalition of Communities of Color. The initiative requires the city to levy a 1 percent surcharge on retailers with at least $1 billion in national sales and $500,000 in Portland sales. More than $30 million per year is expected to be raised, with the money dedicated to environmental projects centered in low-income neighborhoods and those supporting people of color, including job training. Approval of the fund was a rare bright spot nationally for the environmental movement. As a result, activists around the country are anxious to learn lessons about how Portland's green, brown and black coalition came together and whether the measure can be emulated elsewhere. "We all know that all eyes will be on us," Lee said. So those involved expect to take much of this year to set up the program, and start awarding grants for projects next year. The core of the program is creation of a nine-member community panel that will vet proposals to spend the money in various projects that fit the mission. Each member of the City Council will get to pick a member, and those five will forward recommendations for four additional members to the mayor for approval. But there are other preliminaries to take care of before various groups solicit names for that panel. For instance, the city Revenue Division has crafted slight rewrites of the voter-approved measure's language about taxation, and the necessary tweaks to the city code to put those into place. Those will be brought soon to the City Council for approval, Watson said. Lee said measure supporters view those as "friendly amendments" and will support them. The Portland Business Alliance, whose leaders opposed the measure and raised questions about the level of taxation involved, has not raised any objections to the changes sought by the Revenue Division. After corporations file their 2018 taxes by April 15, city officials will have a better idea of which companies are liable to pay the new tax. Lee predicted the city will let those companies know of their new obligations by May. Though the new tax took effect on Jan. 1, the city does not expect to collect the tax for many months. Advocates understand that companies need time to adjust their accounting procedures and staff to do that, Lee said. Organizers expect to use the rest of this year to frame duties of those on the funding committee, select the members, conduct the appropriate training and education of the members, and establish criteria for awarding funds. Organizers are discussing whether existing staff from the Bureau of Planning and Sustainability will be enough to do staff support for the project, or if new people need to be hired. One looming challenge will be developing accountability and conflict of interest provisions, to assure the program doesn't get tarnished as wasting funds, or providing subsidies for the same nonprofit groups that sponsored the measure and have great interest in seeing projects funded. Once that all is in place, the panel will issue a request for proposals from various entities proposing projects that fit the mission as spelled out in the initiative. Then that process will be repeated as funds are available. During the campaign, opponents charged that likely tax collections from the measure as structured might be as much as three times the $30 million per year suggested by advocates. The city will get a more accurate handle on the proceeds later this year. By next year, it's expected that tens of millions of dollars will be ready to deploy for installing solar panels, weatherizing homes of low-income people or other projects benefiting the environment and people who ordinarily are left out of such programs.